2 Year Warranty with original owner/purchaser for frame, materials and workmanship (Labor not included). 1 Year* Warranty on foam. 1 Year* Warranty on upholstery. Replacement return shipping back to customer included (USA only, international not included). Features storage shelf, interlocking lefts, adjustable height, and rounded corners. Specifically designed as a high-end clinic or spa solutions. 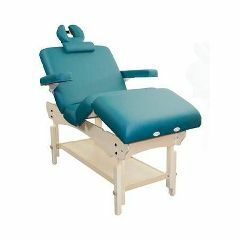 Manual hydraulic lift spring adjustment for both back and knee sections provide easy and accurate positioning for incredible client comfort. Some assembly required. * in Crème photo not included. Sold separately. Height Range: 24" " 31.7"